We already knew Mediatek was working on MT6592, an Octa-core Cortex A7 processor for smartphones, and MT8135, a quad core bit.LITTLE processor for tablets, but in the last few days, the company revealed a bit more information about its two new application processors, mainly to show how better there are compared to the competition. 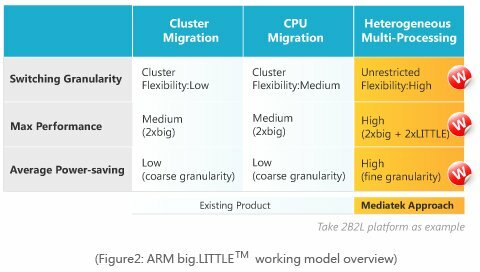 With Exynos Octa (5410), Samsung was the first company to release an ARM powered Octa-core application processor, but Meditak explains their solution is better because MT6592 can use all 8 cores simultaneously whereas Exynos 5410 is limited to 4 at at time, and the claim is true because Samsung big.LITTLE implementation choice. Exynos 5420 will change that however, as soon as this month, but Mediatek obviously did not feel necessary to mention this details. Advanced web browsing – Ability to allocate individual browser tabs to CPU cores to improve loading times. 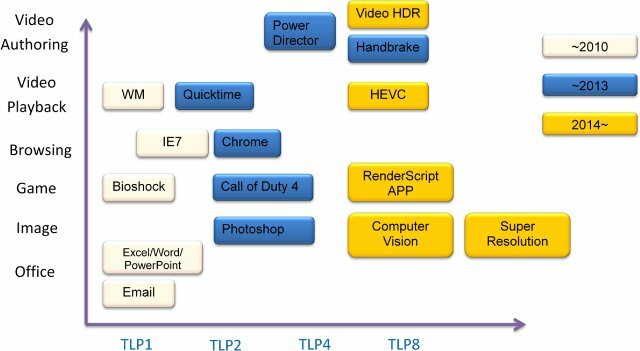 Efficient video playback – When on decoding mode, the battery used for decoding HEVC (H.265) FHD video can be reduced by up to 18 percent compared to current quad-core solutions. 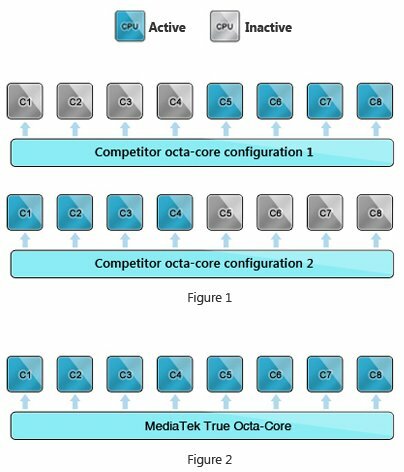 While on display mode, MediaTek True Octa-Core provides users 20 percent more frames. This is for software decode. 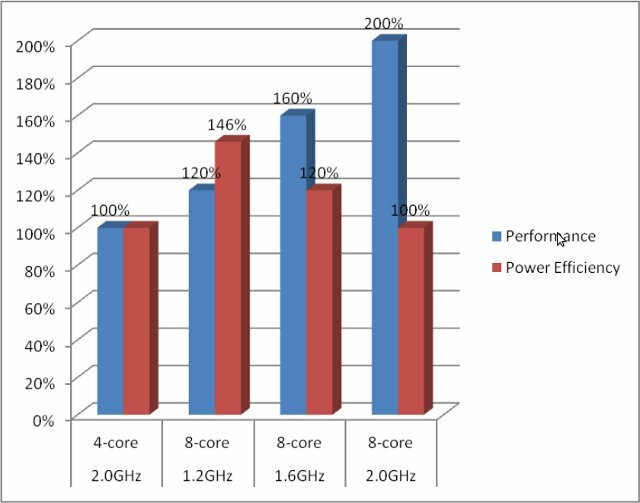 MT6592 eight cores will be clocked at 2.0 GHz, be combined with PowerVR Series 6 GPU (SGX6XX) and 3G modem. The SoC will also support 1080p video playback and displays, 13MP cameras, and become available in Q4 2013 for about $20 in quantities. Mediatek appears to take another stab Samsung, with the latter botched big.LITTLE implementation in Exynos 5410 that only supports Cluster migration, as Mediatek MT8135 will feature 2x Cortex A15, 2x Cortex A7 supporting Heterogeneous Multi-Processing (HMP), now renamed to Global Task Scheduling (GTS) by ARM. Contrary to cluster migration or CPU migration, GTS implementation allows all cores in big.LITTLE SoCs to be used simultaneously. The simple tasks are sent to individual LITTLE core(s) (Cortex A7 here), whereas more demanding tasks are sent to individual big core(s) (e.g. Cortex A15), or if maximum power is required all cores can be fired up. The company compared their MT8135 reference tablet with competing tablets. Geekbench probably only used the 2 Cortex A15 cores, as the difference with Exynos 5 Dual can just be explained with the CPU clock difference (2.0 GHz vs 1.7Ghz), so in this test, I assume the Cortex A7 were not used. 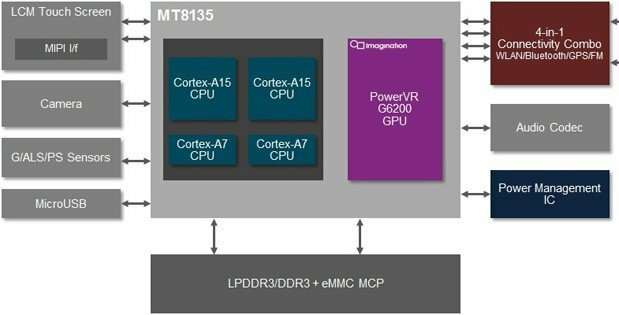 MT8135 CPU cores will be clocked at 1.5 to 2.0 GHz, and be paired with PowerVR G6200 GPU, without modem, and become available in Q3 2013 for $15 or more in quantities. I will waiting for this SoC MT8135 DevBoard ! I’ve never seen Mediatek work with anything else than smartphones and tablets manufacturers, so getting an MT8135 dev board might be challenging unless you work for one of these. So, re MTK8315’s Antutu score, two A15 cores at 2.0GHz is ~ 33% faster than RK3188’s 4 A9 cores at ~1.8GHz?? Or is this a comparison the ref tablet resolution issue mentioned could be distorting? Add initial device tree nodes for EXYNOS5410 SoC and ODROID-XU board. a small developer board with this kind of chip ? In the meantime we play around with whats available. Have a look on my blog about ARM based computers and boards which run Linux.